I was thinking about why I like tartan pattern so much, when one reason crossed my mind. I figured that it probably has something to do with the history and the culture behind this particular pattern. After all, I always say that traditional and folklore clothing (be it original or reproduced) carries additional value. Traditional patterns can be such an wonderful source of inspiration. Traditional patters have soul to them, one might say. The history of tartan is particularly interesting. Today we mostly associate tartan with Scotland, but according to some historians, tartan like fabrics were used by ancient Celtic populations spreading across the British Isles as early as the sixth and the eight century BC. Well, that one old pattern for sure! However, even if tartan clothes are really as old as ancient Celts, it is the still Scotland that is responsible for tartan we know today. Did you know that different tartan patterns can represent different Scottish families? Something like a family's personal coat of arms. How cool is that! So, today we'll talk tartan print. I have quite a few tartan items in my closet and I wear them quite often. Today I'll be sharing two casual tartan outfits that I wore recently. 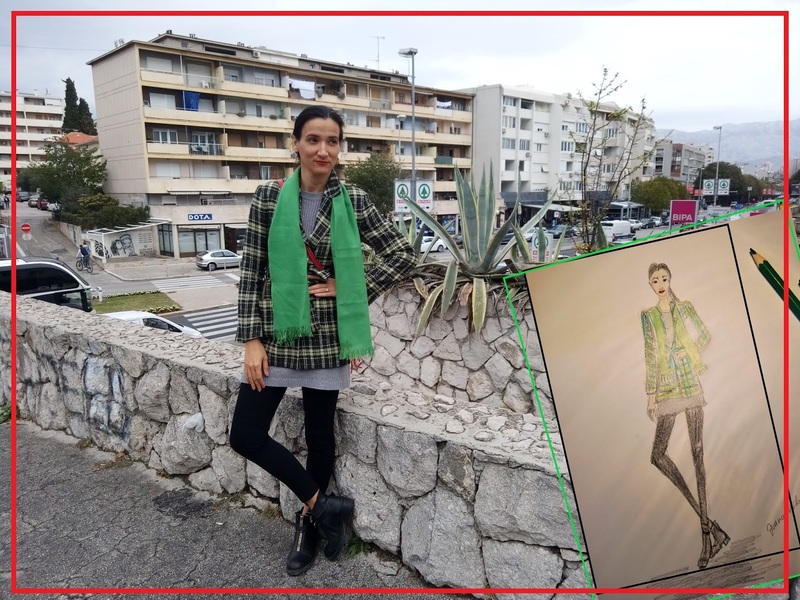 In addition, I'll also share a fashion sketch I drew when I visited Split recently. It was just a quick sketch because I took advantage of state holiday (All Saints' Day) to visit my family and I didn't have much time for sketching. I also forgot to bring my art supplies, so a quick sketch is all I could master. I illustrated an outfit I wore while I was there. A pretty simple outfit, really. 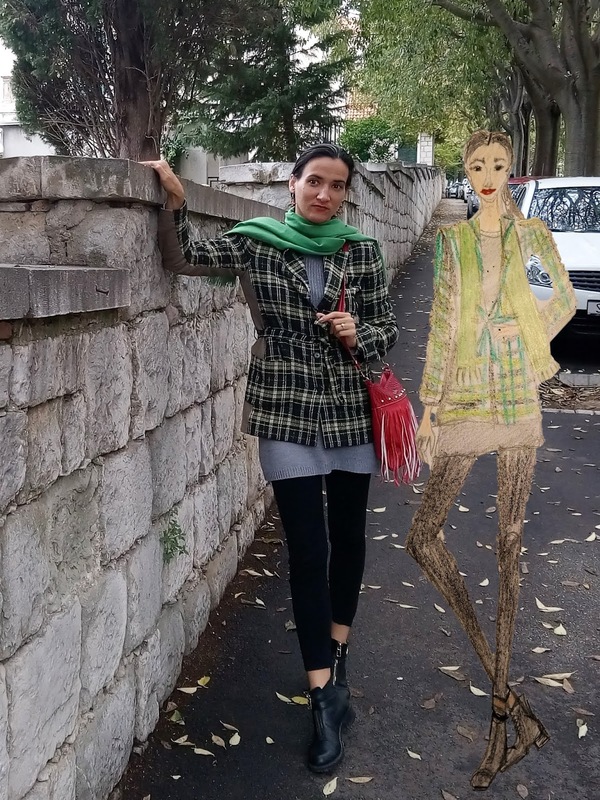 The first outfit I'm sharing (the illustrated one) is similar to another recently shared outfit in that it consists of a grey sweater dress and leggings. However, this time I wore these two items with a tartan short coat (you could also call it a long blazer if you like) and a pair of biker boots. I wore this outfit for a walk in my lovely hometown (I'll share more photographs of it some other time). Styling tartan print in a casual way is not terribly difficult. All you need to do is to pick a comfortable pair of shoes, for example a pair of sneakers or a pair of biker boots. A great thing about tartan is that it's quite eye-catching. Even a bit of tartan pattern (or print) can help infuse colour and pattern into your everyday outfits. It's the perfect accent. On the other hand, if you want to be more fashion forward, tartan print can be your best friend. For a statement look, try pairing different tartan patterns. If you're going for a particularly bold look, try mixing tartan pattern with a floral or geometrical one. I love to style tartan with green, it seems somehow appropriate. I always imagine Scotland as this extremely green place, and perhaps I've connected the two (Scotland and tartan) in my head. Well, this tartan coat is mostly green, but more green can't hurt so I went with a different shade of green and added this scarf. I can't tell you where this scarf is from because I nicked it from mother dearest. I'll have to ask her some time. I do remember my mother wearing this scarf when I was a kid, so it's definitely vintage (because I'm in my thirties you know). I have almost a photographic memory of clothes my mother wore when I was a kid. Is it just me or are you the same way? Do you remember your mother's old outfits? Back to the subject.... Can you ever imagine autumn and winter without cozy scarves? I know that I can't. A nice scarf is both the perfect protection against the cold and a lovely fashion accent. Speaking of accents, red accents also work well with most tartan print. Here I opted for a red bag and a red lip. I'm terribly lazy when it comes to make up, but lately I've been putting in some effort and trying to do at least my browns and lips. A red lip is such a classic, isn't it? It's been a while since I wore this red fringed bag, so I figured why not? This bag might come in handy if I decide to opt for a western/ cowboy inspired look. The western chic has been trending, hasn't it? Maybe I should try to jump on wagon as well? It is never too late to try a fun trend, right? Now, here is another casual outfit proposal for warm Autumn/Fall. Bellow you can see a combo of two colours: military green and yellow. I think those two colours work really well together. What do you think? Are green and tartan somehow meant to be? 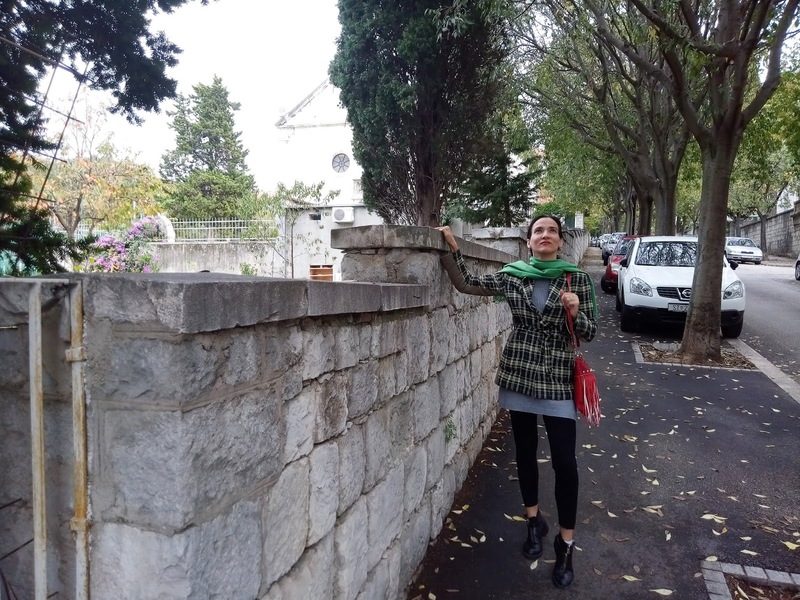 Anyhow, I wore this outfit for a stroll in Mostar. Two somewhat similar outfits, for two somewhat similar cities. I have some new posts about Split and Mostar in the making, but they'll have to wait a bit. As I said, styling tartan isn't hard. This would be my casual outfit proposal for styling a yellow tartan skirt. It's a quite comfortable outfit. In addition, I like the fact that this long vest has a bit of flower print on it, so I ended up with a bit of print mixing. This (predominately yellow) tartan skirt is an old favourite. It's vintage, I absolutely adore it and I wear it every single year, ALL year around. Do you have any clothing items like that? Things you wear all year around? Items you can't imagine your closet without? I don't actually own anything tartan but I think I might be inspired to add a piece to my wardrobe after seeing how chicly you styled your items. I think a blazer would be a great addition and I really like your autumn look topped off with that pretty green scarf. thank you. A tartan blazer is a great item to have in one's closet. In the UK tartan is often part of our school uniform so many of us avoid wearing it as adults. I did wear tartan trousers as a teenager but I've not worn it for decades now. If I have any vintage tartan on my rails it invariably sells to Japanese students. Thank you. You just reminded me that I have a vintage pair of tartan trousers I need to revisit. Loving the tartan coat and what a nice way to style it. Both looks are nice and look comfy. Such a cool blazer and great styling hun! I know it's pretty interesting,isn't it? Given the history of the garment, it makes perfect sense. love your cute illustrtions and the way you've styled your ourfits is fab. I'm a fan of tartan too, it's such a classic look. How amazing you can remember what your mother wore from when you were a child, Ivana!! And I'm in love with both outfits. Especially how you added in the floral sweater and sneakers!! Love these tartan pieces. They totally draw attention to the whole look. Beautiful! interesting and quite informative too. Love your artwork and your fashion style. Ci credi che io non ho ancora niente in tartan??? Mi vergogno un po', bella la tua giacca e anche la gonna! Invece non sapevo che il tartan esistesse già prima di cristo. Oggi ho fatto una scoperta grazie a te! I like your look, dearest Ivana! And I like your drawing too! Such a lovely pattern. You are right, traditional patterns do look beautiful. 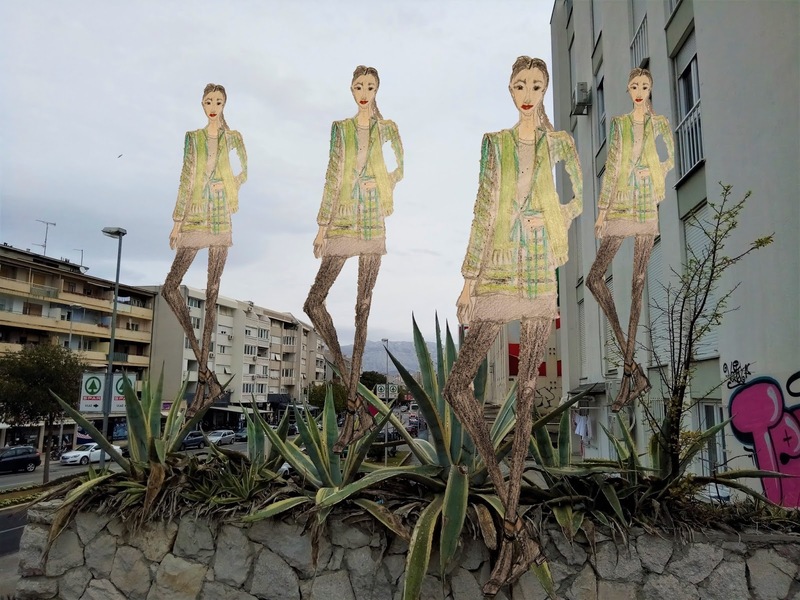 You are a fashion illustrator? and no, I'm not a real fashion illustrator. It's just a hobby of mine. I love tartan too. I had no idea there was such a history behind it though! Love this jacket! You styled it well! 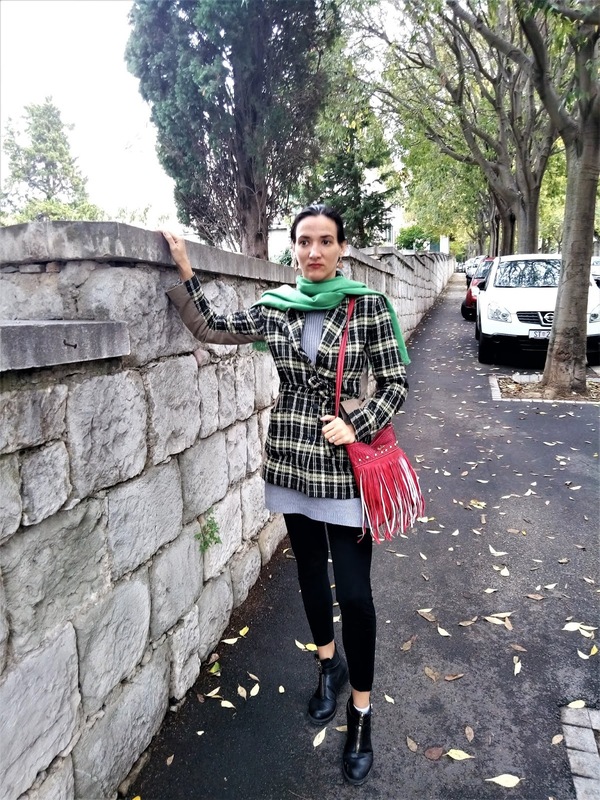 Beautiful tartan pieces Ivana! I love the way you styled them! 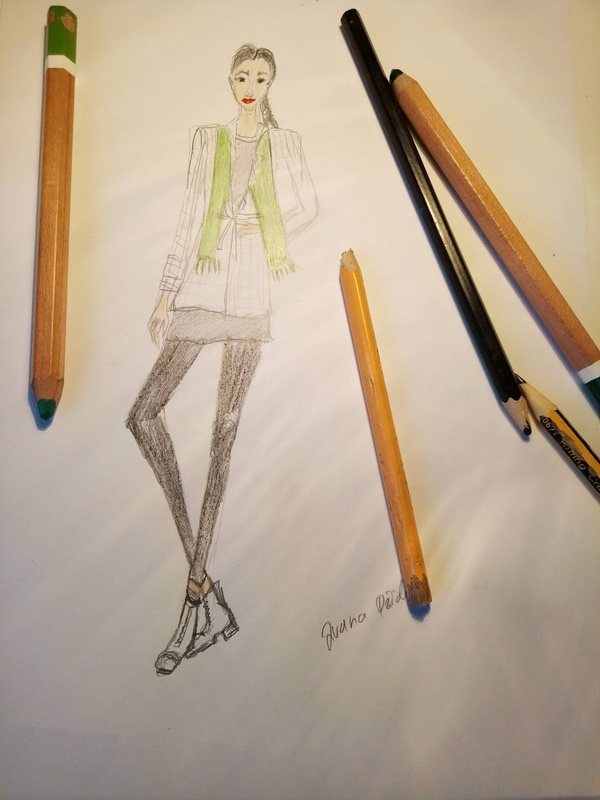 Have you ever considered going into fashion illustration? You're drawings are wonderful! I adore both of your tartan outfits, Ivana! The jacket looks very cool and elegant, and the skirt is playful and cute! I also remember Mom's outfits vividly! We looked at our mothers every single day, for years, when we were kids. I know I admired my Mom and her style - she was always the most beautiful woman to me. Another side of it, Mom didn't have a large wardrobe (still doesn't actually), so all of her outfits were constantly on repeat, not too difficult to memorize them. I know what you mean. We did look at our mothers every single day for many years so it makes sense they influence us so mucj. That tartan skirt its so nice! NEW COOKING POST | WONDERFUL RECIPES CAME BACK!! I'm a big lover of tartan and love all the tartan. I can't stop myself to purchase more tartan clothes especially in winter. Both outfits are beautiful but my favorite is the first one. 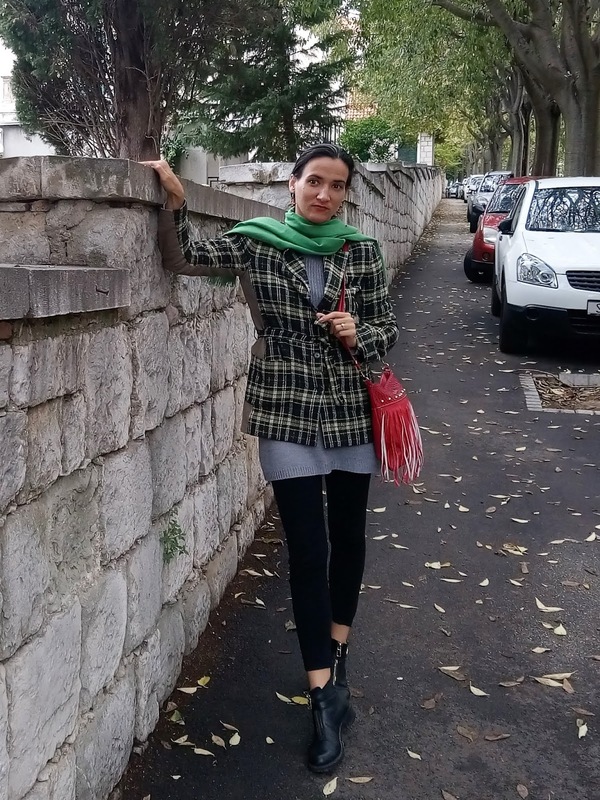 I adore the idea of wearing tartan blazer over the long pullover. It looks cute. Hope you had a lovely weekend. thank you dear, I love tartan too. Adorei a postagem, as fotos são lindas demais! Mi piacciono molto entrambe le proposte!!! Sempre bellissima! I'm not surprised you love tartan that much, dear Ivana, and you are right it is not too difficult to style this pattern. I like both of the looks you show here and I must say you know how to style tartan very well. Also the illustration with your first tartan look turned out very beautiful. Thanks for the inspirations and have a happy week. You are so talented dear! Love the fact that you added a few drawings too! Super chic look as well! Love it! A me piace moltissimoil tartan per l'autunni/inverno, ho già diversi capi con questa fantasia ma quest'anno sto trovando tantissime altre cose carine nei negozi! Ivana Ivana Ivana, I love your creativity with your sketches. Amazing! I love the photo with you and the sketch by your side. Looks like you and your friend. Lol!! You look amazing! That blazer is so good. 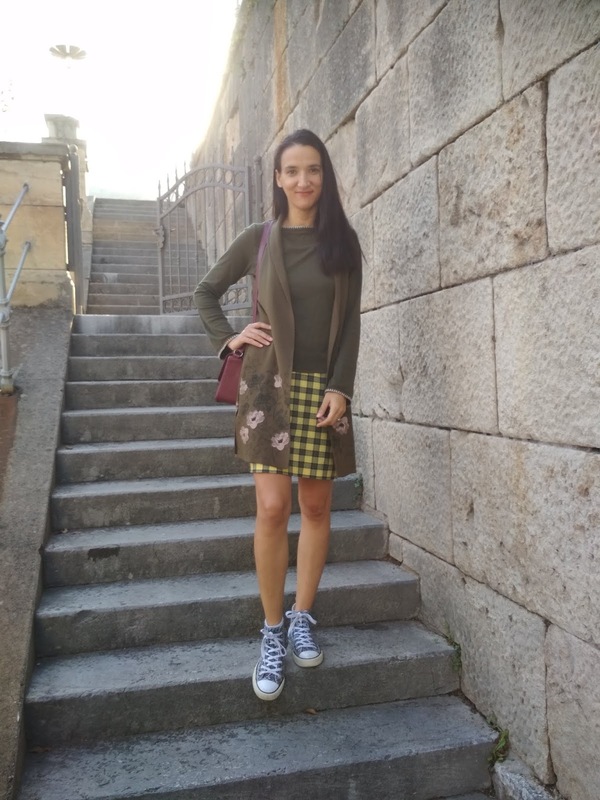 Outfit stupendo, adoro il tartan!! It's always such a fun print to play with! I love the fusion of "real" fashion in "real" life and your drawings. And yourlook is so perfect for the cooler days. Ideal for autumn my dear. thank you Nadine. I'm glad to have inspired you to wear your tartan skirt again. Great post. I didn't know about history of tartan and it is very cool because it represent some family. I really like both of your outfits,blazer is amazing and skirt is so cute. thanks dear, yes it's very cool how there is so much meaning behind tartan print. You have a great style and sense of fashion and I love the way you illustrate an outfit and then wear it. Beautiful outfits, Ivana. You wear Tartan perfectly. It's such a great idea to add the fashion illustrations to your outfits! The second outfit stole my heart! I´m in love with the cardigan with the flowers! I'm not usually wearing tartan print but I enjoyed all your looks especially the tartan skirt!! mi piacciono entrambi look,molto belli,io ho puntato sul rosso,guarda la mia gonna https://stileo.it/gonna-scozzese-con-cinturini_20142359 che ne pensi?ti piace come look autunnale? si, mi piace tanto. Rosso e' uno di miei colori preferiti e' questa gonna tartan e' davvero bella. I love both, I also want to start designing my outfits or what I have in my closet. I really have been supporting myself at http://bit.ly/2Fx6400 to learn how to illustrate.